The University of Pittsburgh is a state-related research university, founded as the Pittsburgh Academy in 1787. The Chevron Science Center is home to Pitt's Department of Chemistry, one of the nation's largest undergraduate chemistry departments. The department has awarded more than 1,000 doctoral degrees and their alumni and current researchers in the department have made important discoveries in fields like recombinant DNA technology, alternative fuels, and have pioneered in transplant therapies. 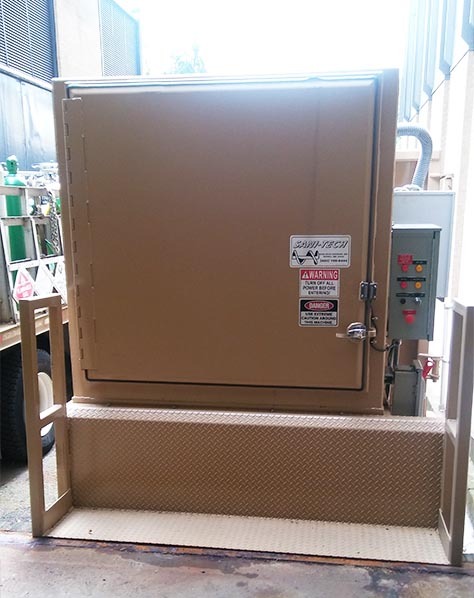 Sanitech Systems installed a SC1046-36 with a receiver container at the Universities Chevron Hall. The way our University Compactors are designed allows for the recycling team to load cardboard boxes without having to break them down saving the University valuable time and money. The Universities carbon footprint is reduced when using a Sani-Tech Auger Compactor. Our all-electric rotary drive eliminates the use of hydraulic fluid, along with the risk of contamination, line breaks, leaks and filters. Our all electric approach means your machines produce zero emissions and run quietly. This ensures your students, staff, and communities near the university are not disturbed. If you have questions or need assistance getting a auger compactor for your facility do not hesitate to contact Sani-Tech today at 1-800-467-7336 or by filling out the form on our contact us page.